Looking for a quick and efficient way to grill while also removing excess fat from your favorite foods? Then look no further than the George Foreman Vari-Temp Grill. 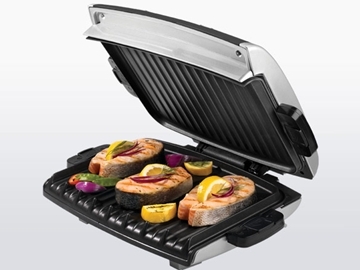 The George Foreman Vari Temp Grill is one of the newest entries into the George Foreman family of grills. Unlike its predecessors, the Vari Temp grill includes adjustable temperature control, as well as an on/off switch. The Vari-Temp Grill is capable of cooking a variety of different foods: chicken, beef, fish, etc. The temperature control option adds to the versatility of the device, allowing the temperature to be adjusted for vegetables, sandwiches, etc. The temperature can also be increased for even quicker cooking, which is impressive because the Signature Foreman Heating Elements already allow for quick and easy cooking. The patented sloped design forces excess fat away from your food (A Whopping 42%) leading to an overall healthier meal. This makes it a perfect option for those looking to jump-start a diet without sacrificing flavor. And flavor is one thing that the Vari-Temp Grill does not sacrifice. Food is cooked quickly and the results will leave you salivating. The double sided design makes sure that every dish is cooked evenly. Even though fat is being removed from the food, upon completion food still stays tender and juicy. The extended loop handle transforms the grill into a Panini press. The device also comes with a grease collector to limit the mess after cooking, as we The addition of the on off switch is a bit problematic as it is placed poorly and can lead to burns when attempting to turn off the device. Although it boasts that the non stick plates are easy to clean up, grease and oil tend to be hard to clean out. Additionally, the plates on the device cannot be removed, making clean up a hassle. Oftentimes, cleanup can take just as long, if not longer than actually cooking does. Also, the device is large, which allows for a wider cooking area, but this increased size can lead to space issues. For those looking for a quick and versatile way to grill food, or for those looking to cut excess fat from their food, the George Foreman Vari-Temp Grill will make a great addition to any kitchen. At a reasonably priced $39.99 (USD) it is practically a steal. Those worried about the time consuming clean up should stay away.